The roots of a modern tragedy are exposed. Today’s workplace is not what it once was. Gone are the days of corporate loyalty and rewarding seniority found in the immediate post-WWII work environment. Today the rapidity of change impedes attempts to even describe the contemporary norm, and when dynamism becomes normal, Sennett (Flesh and Stone, 1994, etc. ; Sociology/New York Univ.) worries about the impact the new workplace has on the people who work there. The belief that work is closely related to character has deep roots in Western society, and in an era where capitalism is evolving far more rapidly than human beings, there is good reason to worry. That a capitalist economy involves change, or uncertainty, or risk, is nothing new. Entrepreneurs have long driven the economy forward, in part, by embracing these conditions as the cost of potentially realizing large rewards. Today, however, conscious risk-takers have no monopoly on uncertainty; it’s “woven into the everyday practices of a vigorous capitalism,” and risk has become “a daily necessity shouldered by the masses.” Through interviews, observations, and statistics set against the background of a similar study undertaken 25 years ago, Sennett captures the tension this creates between contemporary work and human life. What is the place of commitment, sacrifice, caring for others, and looking beyond immediate personal satisfaction when work requires setting such archaic notions aside? In essence, there is a dissonance over time. The constancy associated with good character is directly at odds with the realities of the contemporary workplace: “the conditions of time in the new capitalism . 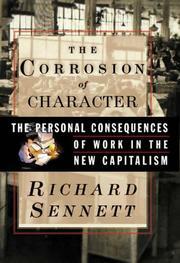 . . [threaten] the ability of people to form their characters into sustained narratives.” Sennett is no Luddite, but this deeply provacative essay exposes the continuing human cost of progress. A depressingly perceptive analysis.